We were all quite happy to pack up the next morning and pile into the car rental company's collection car. It took us out to near the airport and we picked up our green flash station wagon rental (MOT 26) with over 200,000 km on the clock. Our first stop was to yet another strip mall suburb to have lunch and pick up supplies. Another fab food court – our relative proximity to Asia furnishing us with much better quality and choice of food than we were all used to. We got camp food and then went to NZ's answer to Walmart – The Warehouse to pick up camping gear – mini bbqs, a pot, a cool bag and such-like. We were fed, had stocked up and the car was full of petrol – but we didn't really have a plan so we just headed North. Finally we got out into the countryside – very picturesque with rolling hills, tidy farms, wide bays and windy roads. Up the Northlands peninsula towards Russell, NZ's first capital and the Bay of Islands. The initial plan was to visit a Department of Conservation (DOC) campsite but that was foiled by lack of information – the place we were aiming for was actually on an island. Plan B was to free camp so it was just a matter of finding the right spot. We saved some time by using the little car ferry to get into Russell itself but it soon became apparent that it was all too nice to free camp. Signs abounded saying no camping here and no loitering there and a liquor ban somewhere else. We cut our losses, getting hungry and checked into a commercial campsite – at a price comparable to staying in a hostel – something wrong about that. Really have to get a DOC leaflet with some facts on it! The campsite was actually quite good – we had an entire field almost to ourselves. On putting up the tent we discovered that one of the poles didn't connect to the others but the masking tape came to the rescue again. It was Oli's birthday and we made a makeshift table of wide wooden logs and had a little party complete with a cake and candles. The sky was very clear and throughout the night strange noises accompanied the chill– the prim owner told us that there were Weka, wild flightless birds on the site endangered like the kiwi yet more inquisitive and feisty . One wandered over to the camp during breakfast and picked at a shoe. Having failed to really get into the wilderness and the clock already ticking – 8 days till the car had to be dropped off in Wellington, we made a move. We managed to get a DOC leaflet in a picturesque place called KeriKeri with an old (1800s) granite building by a river. The building had been restored to its former glory to within an inch of its existence – right down to the period dressed staff. Unfortunately the DOC office was on the other side of the river and there was no bridge so I had to ford it to get the leaflet. Bizarrely there were a few stuffed kiwis in the office. They clearly take conservation very seriously here. Initially we thought of making our way up to Ninety Mile beach but a friend had said it was a long (ninety mile!) drive on a dusty road without much gold at he end of the rainbow, so we made an arc around the peninsula and started to head south along the west coast towards the native Northland Forests. New Zealand lies on the ring of fire, the region of volcanic activity surrounding the entire Pacific Ocean and has a large number of geysers, hot springs and other volcanic phenomena. 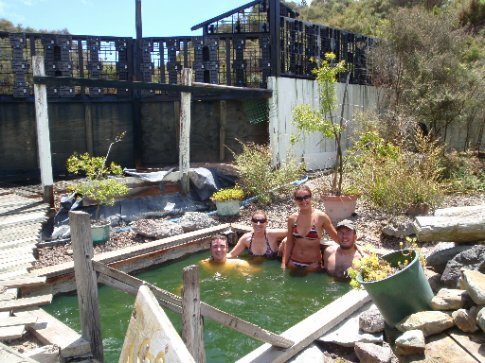 We chanced upon Ngawha Springs in the heat of the midday sun and took a visit. It was a myriad of pools of varying temperatures and hues of murkiness, separated by wooden slats and all surrounded by a sulphuric gaseous overtone. We stripped off and tentatively dipped our toes into the murk, some for mere seconds, like “the Doctor” perilously hot at over 50° C, others much cooler and bearable. At the bottom of the opaque pools was a thick silt of minerals. We stayed for a few hours, getting a bit burnt in the heat of the sun. Every stitch of clothes worn anywhere near the place stank for days, but it was well worth it. The next campsite, finally a DOC one, was beside the Trounson Kauri Park and did not disappoint. There was no owner or guard to speak of, very reasonable fees are paid into a little plastic envelope, plenty of space, great facilities and quite curiously a persistent sound of nature – not birdsong of cicidas as I might have expected, but the last throws of what must have been the wild donkey of the apocalypse. This thing was completely deranged and obviously very distressed and very very loud. It became a bit of a joke after time but no matter how hard we gazed at the field of cattle quietly grazing could we identify the culprit. We had a pleasant meal, eating in the kitchen as we had no table or chairs and it was pretty chilly. Our idea to get fleece throws rather than sleeping bags now seemed quite ludicrous. The whole point of being here was to trek in the forests so that was just what we did the next day, driving back up the way we had come to Waipoua Forest. First trek was up and back through the cool sub tropical moist forest, complete with silver leafed ferns and fern trees to a lookout – it was tall, well constructed and looked out over .... the forest! Strange. Next was a refreshing dip in a chilly swimming hole fed by a river and after lunch we drove up to the Kauri stands themselves. Kauri are a type of monstrous pine which grow only in NZ and as if to remind us of Alerces we visited in Patagonia, are the second largest trees in the world after the Californian Sequoia. Individual trees can reach over 2000 years old and up 50m in height and a staggering 20m in girth. While once upon a time they were all over New Zealand, Australia and South East Asia, by the time humans arrived they had been concentrated to the North of the North Island. The wood was greatly valued bu Maori (for their Canoes) and Eurpoeans alike and at this stage over 75 of the remaining mature Kauri are in the Waipoua and Trounson forests. We walked to the Four Sisters, four slender Kauri growing in such close proximity that they are as one, and to the enromous Te Matua Ngahere, the father of the forest, second largest in NZ. Onwards to Cathedral Grove, (the cathedral buttresses and pillars formed by trees) and finally we came to Tane Mahuta, the King of the Forest, staggeringly enormous. All this nature and walking made us hungry so we went back to camp for dinner. I have to admit that I am a bigger fan of fauna than flora so was looking forward to the evening's activity – a night walk through the Kauri stand at the bottom of the campsite with the main goal of hoping to sight the elusive Kiwi. They really are so good at doing this sort of stuff in NZ the campsite providing red plastic to put over your torch so you disturb the animals as little as possible. The 90 minute jaunt failed to show us Kiwi, although we did hear them call and managed to see lots of glow worms,, a large river eel and a giant carniverous kauri snail “that eats worms like spaghetti”, as the DOC information board along the track told us. What is, I think interesting about NZ fauna is that humans only arrived about 1000 years ago. Before that the only mammals in NZ were bats. As such the fauna that I am a big fan of actually don't exist in NZ, or rather they shouldn't – native species are not capable of competing with or defending themselves against introduced species such as cats, dog and stoat. Possums are particularly vilified and poisoned or trapped with aplomb. Our friendly neighbourhood apocalyptic donkey serenaded us to a frosty sleep after the night walk. Having spent more time than anticipated in Northlands we needed to make tracks so we made for the Coromandel Peninsula, meaning we had to pass back through Auckland, but not before stopping in to look at the remains of the Rainbow Warrior in the functional town of Dargaville. We used the opportunity of heading through Auckland to go back to the same food court for some more yummy Thai food and also to pick up some sleeping bags and some citrinella candles in Warehouse. If you're camping you need sleeping bags, no matter what height the summer.